[Shanghai, China, November 22, 2011]: Huawei, a leading global information and communications technology (ICT) solutions provider, was awarded with the Global Growth and Innovation in Telecom Managed Services of the year Award, the only award in the global managed service field, by Frost & Sullivan at the Global Community of Growth, Innovation and Leadership 2011, which is held in Shanghai on November 8, 2011. 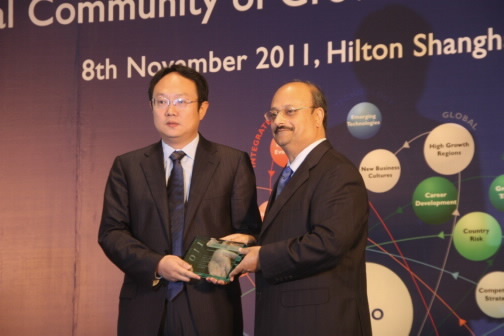 Aroop Zutshi, Global President & Managing Partner of Frost & Sullivan, presented the award to Huawei. This honor further recognizes Huawei's leadership and solution competitiveness in the managed services field. According to the global survey conducted by Frost & Sullivan, Huawei has become an important provider of the world-class telecom managed services. Huawei Managed Services has made excellent achievements in compound growth, market position, innovation, and delivery capacities over the past year. "The Global Growth and Innovation in Telecom Managed Services of the year Award is presented to the most influential provider in the global managed service field. Candidates are reviewed under several important criteria, including innovation, market strategy, and market potential. We hope to present this award to unique products and services with great potential while being able to bring value to enterprise users. Huawei's success benefits from the global market leadership of its managed services and collaboration and cooperation with the world's first-rate telecom operators under its strong growth momentum," said Dr. Neil Wang, Managing Director of Frost & Sullivan. "This is recognition of the achievements made by Huawei Managed Services," said Han Xiao, Director of Huawei Managed Services Product Line. "The number of Huawei Managed Services contracts has increased from 2 in 2005 to more than 230 today. Its services cover fixed networks, mobile networks, multiple vendors, and multiple services with a compound growth rate at more than 70% for six consecutive years. As an important strategic investment of Huawei Services, we are always dedicated to establishing long-term strategic partnerships with global clients in managed services to help our clients succeed." To better support operatprs'requirements in future ICT industry convergence, cloud computing, All-IP network evolution, and Fiber Broadband(FBB) and mobile broadband (MBB) network operation and maintenance, Huawei keeps innovating and developing the Managed Services Unified Platform (MSUP) based on global telecom and IT standards, such as enhanced Telecom Operations Map (eTOM), Information Technology Infrastructure Library (ITIL), and TL9000. This platform has a process-driven architecture and integrates operation and maintenance processes, organizations, and IT systems, enabling effective centralized management of operators'telecom services. Its processes have been certified by TeleManagement Forum (TM Forum), the world-class telecom management organization. In addition, Huawei has developed and customized E-iNOC telecom operation and maintenance system, effectively increasing the operation and maintenance efficiencies of managed services. "Huawei Managed Services dedicate to increase the operating efficiency, reduce the overall operating costs while make substantial contribution to end-user perception and increase operating revenue. To address future telecom operation requirements, Huawei Service will be based on its industry-leading end-to-end solutions, global organization and professional platform close to clients, increasing the innovative investment, assist operators to sustainable development." said Dr. Liang Hua, President for Global Technical Services at Huawei.